I’ve already covered the topic of gain staging before but since it’s been 2 years and I’m now using Pro Tools, my work flow has changed a bit. I wouldn’t say it’s a night and day change but enough to warrant an article on how I now approach gain staging. Now try not to look at this article as a technical masterpiece on the topic of gain staging because I honestly don’t look at it that way. I have one ultimate goal – Make sure that my channels and master fader aren’t clipping. That’s it; it doesn’t get any simpler than that. There are times when certain channels benefit from clipping but that’s for another article. Where to Set Our Levels? Now because technically (in most cases) 0dBVU in the analog world is calibrated for -18 dBFS in the digital world, there are beliefs that -18 dBFS should be your level for each channel. I honestly don’t subscribe to that when mixing ITB (in the box) but I do understand why it may be useful. Using lower channel levels does give you a lot more room to play with when using something like an EQ. Now these are things that could potentially help your mix tremendously however it could also hurt your mix to be rigid with these levels. Some plugins are designed to add compression, limiting or pleasing distortion to a sound once it hits the output at 0 dB. By limiting the output to less than 0 dB you might actually be missing out on some magic in your mix. So What Are Some Solutions to This? Well we could start out with a fairly conservative level for our channels and then when we need to get aggressive on a plugin output, we could always adjust either the input or the output on that plugin accordingly. This is exactly how I would do it. But just keep in mind every channel doesn’t have to be at any specificlevel (ie -18 dbFS). I would normally start out with everything at some consistent level like -18 dBVU or -12 dBVU, for example, but as the mix goes on and plugins are introduced, each track level will most likely change. After I set my initial levels I actually don’t worry too much about where they end up. When I’m mixing and I’m minding my gain staging, my only real focus is to make sure that my clip lights are not flashing red. On one track the level might be at -6 dbFS and the other might be -18 dBfs. Let me give you a scenario. Lets say you’ve got the balance all set up and then you add an EQ to the piano. You add a couple dB’s at 3 kHz and now it stands out perfectly in the mix. But the piano VU meter is now averaging about -10 dB’s and everything else is -18 dB’s. Does it really make sense to adjust the EQ output to -18 dBVU and then push the fader up to get it back up to the level it was previously? As long as we aren’t in the red and it blends well with the rest of the mix, who cares? Just continue to mix and if you notice something peaking, then make the effort to adjust your gain staging on that channel so it’s out of the red zone. There are a couple of exceptions however. If you are intentionally peaking the channel (digital clipping) to get more character from a plugin or it peaks once in a while but isn’t effecting the sound in a negative way, than being in the red is perfectly fine. Almost every plugin these days has some form of input and output adjustments so really you can gain stage with almost anything. That being said I have 3 ways that I usually approach the levels of my channels, 1 of which I almost never use anymore because it just doesn’t make sense to me. Pro Tools comes with a little handy plugin called “Trim” this is great for adding to you tracks to make sure that they are at on optimum level. Using this plugin first in your chain, allows you to make sure your track levels are set right before any type of processing is added. With this plugin, however, you don’t get access to VU settings so if you are the type of person who wants to set your tracks to a “standard” then you are probably going to have to use something like the BF meter or anything similar to it. I tend to use the trim plugin the least. Technique: To use this plugin it’s fairly simple just increase the gain on any track that is low in level and vice versa if its level is too high. Since Pro Tools released their ground breaking “clip gain” the audio world has never been the same. Can you sense the sarcasm? Anyway even if it wasn’t an original idea it still is a great way to gain stage your tracks in a session. The one thing I like about the Pro Tools clip gain is that it shows you visually what the tracks like as you adjust the clip gain level. So if you are a visual person and like all the tracks to visually be at a similar level, this might be for you. Technique: Just like the trim, there isn’t anything complicated about this. Just put your cursor over the little fader in the bottom left hand corner and start adjusting the level – either up or down. Once your levels are set then move on to the next track. 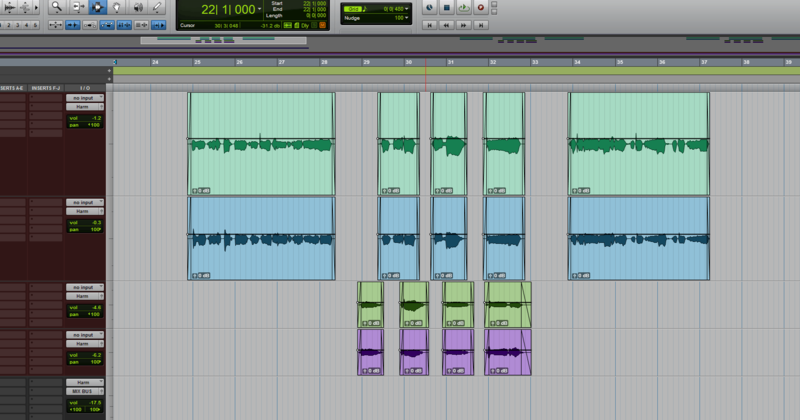 Tip: If your track is cut up then you are going to have to adjust each piece individually. The best option here might be to consolidate and then adjust everything at the same time or just make sure you adjust your clip levels before you decide to slice up your tracks. I really could have called this last one “Console Emulation” but since I use the Satson for the purpose of gain staging, its best to just call it what it is. This tool is very flexible and gives you multiple amounts of options, not just gain staging. One thing that I really appreciate about this plugin is that it doesn’t use a lot of CPU. I could have one on every channel and the CPU meter barely moves, gotta love it. I’d say 90% of the time I’m just using the big gain knob to adjust my input levels with the harmonics (On) button engaged. By turning off the harmonics button, the plugin is still fully functional you just won’t be introducing any distortion. 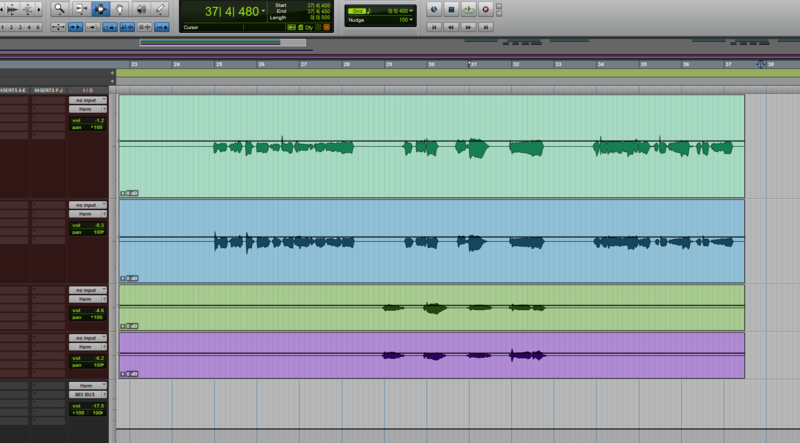 Since the amount harmonic distortion is so subtle, I just leave it on most of the time. Technique: So how I use this one is I aim for an average of -18 dB which is 0VU on the plugin itself. The only thing is I treat the drums a bit differently. I find that since the drums have more transients, the VU reading and the peak reading are quite different. In this case I would adjust the gain to accommodate a particular sound – either make it louder or softer. I would stress a lot less about what the VU says on these sounds and just focus on keeping out of the clip zone. Now I know that the -18 dB level is a bit contradictory to my first post on gain staging where I was setting all my levels to -6 dB. 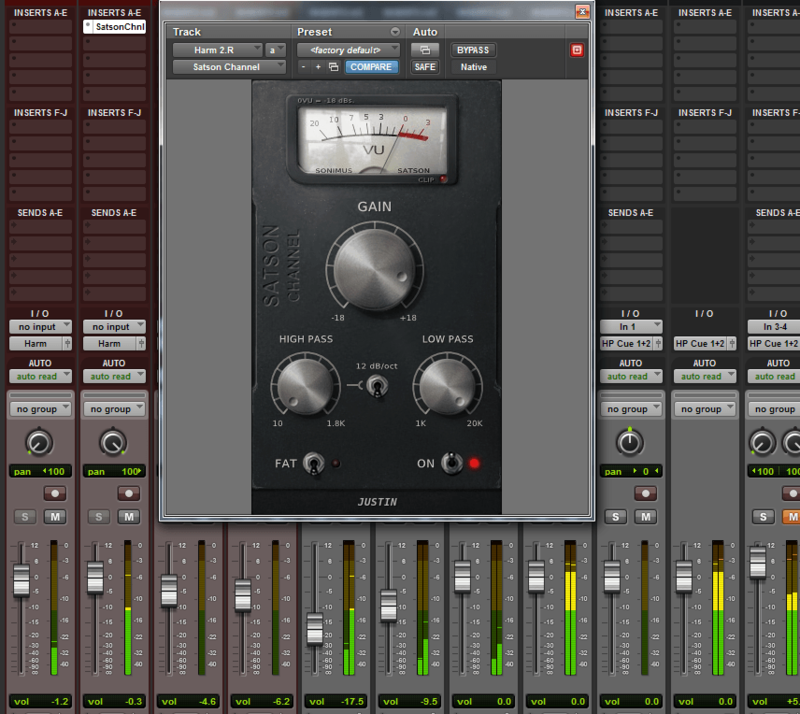 But since the Satson plugin is set up for -18 dB (stock) I just decided to go with it. It’s much easier to aim for that 0VU level then try and ignore it and get everything to -6 dB’s. But again my main focus is to make sure that my clip lights are not flashing red. But between the 3 techniques I tend to use The Satson and The Clip Gain the most. Sometimes I will combine the two of them together to get my initial levels. The reason I would use the clip gain is to get the visual aspect of the audio track up to where its easy to see and then the Satson just makes sure my levels are set more accurately. Another thing I keep an eye out for is my plugin output levels, especially when using something like an EQ. 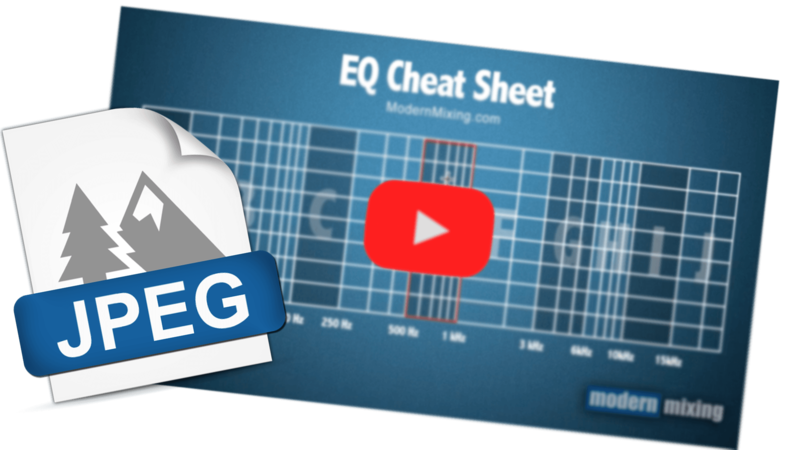 Any time you boost an EQ your output level is going to change – usually it will increase – so I keep an eye on the output meter to make sure I’m not clipping and then I would adjust accordingly. 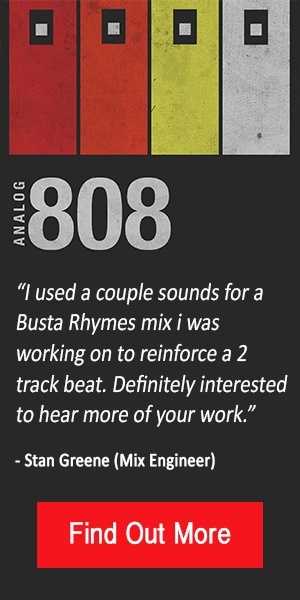 I always start out with a quick blend of my mix and get my output to peak at a set level. Normally I would just use the Satson Buss because it’s easy to read. I have my peaks averaging about -18dbFS or 0VU. That is my starting point but again I don’t honour it until the very end, usually what happens is the Satson plugin is pushing in the reds and my output levels get closer to -10 to -6dbFS once I’m finished. 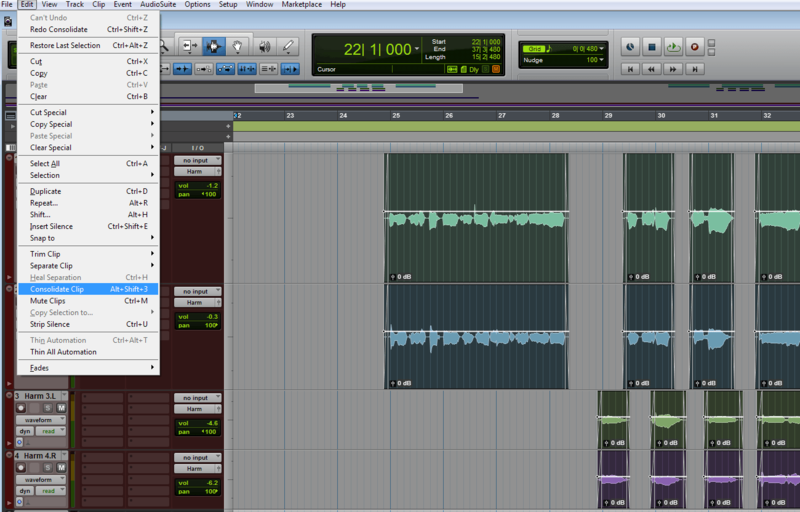 As a result the Satson is adding in some extra secret sauce (harmonics) to my mix. 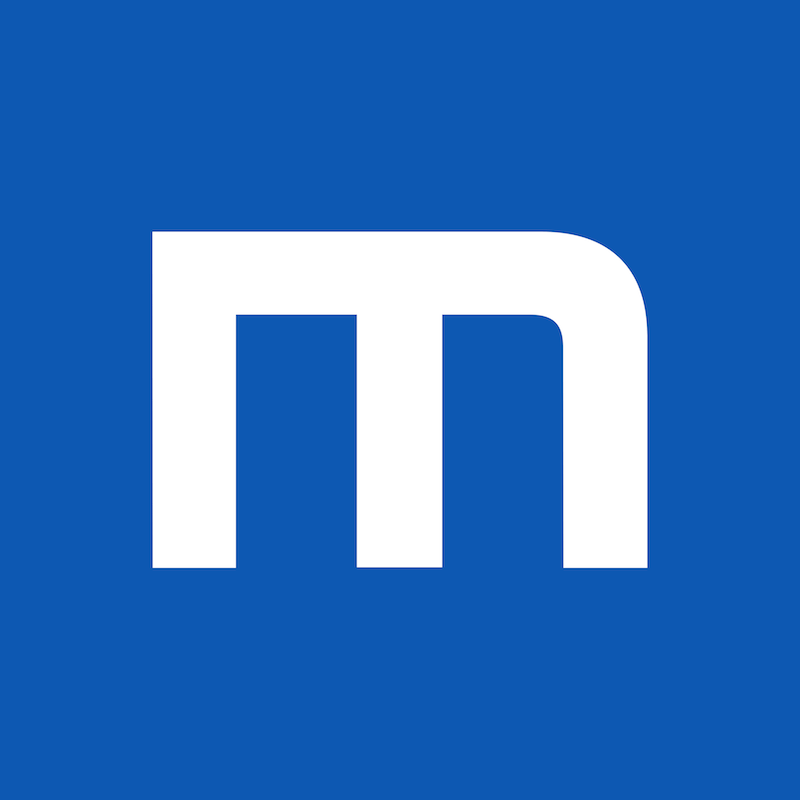 I’d love to hear what other people are doing with their track levels in their DAW – Leave a comment below!